Samuel Beckett’s Play was written in English in December of 1962. Three characters are presented as dead, in funereal urns up to their necks: a man, his wife, and his mistress. They continue, even from their urns, to bicker and rehash their history, and to wonder if anyone can hear them. The text is written as a 10-minute work that repeats in its entirety. The performers are cued to speak by a glaring white spotlight. When lit, they speak continuously until the light shifts to illuminate another character, or is extinguished. Play was produced by invitation for the annual Around-the-Coyote Festival in Wicker Park, Chicago. 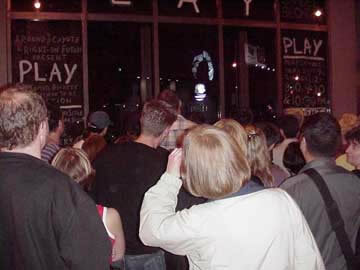 Division 13 Productions set Play in the large display window of Right-On-Futon at a busy three-way intersection, with small microphones mounted on the urns feeding to speakers on the sidewalk. Due to the high traffic at this site-specific location, the production’s technical rehearsals were held in the hours just after midnight. Every technical rehearsal drew an audience. This text presented a rigorous difficulty for the performers, who needed to learn to give their lightning-speed delivery in perfect stillness. Rehearsals could last no longer than 2 hours. The work drew significant media and public attention. Festival audiences ranged from Beckett enthusiasts to those who just happened to stumble across the show. During one performance, more than 100 audience members blocked a bus stop and spilled into the street. 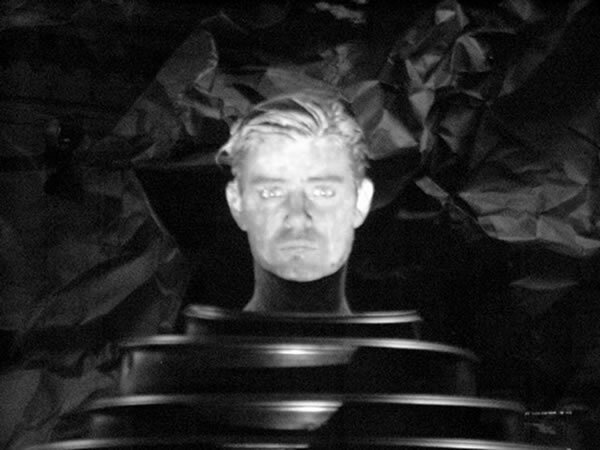 Two unusual aspects of the production went largely unnoticed by the audience: Megan Rodgers played the role of the man, as a man (in full beard), and all three actors performed to their own reflection, thrown vividly against the interior glass of the display window whenever they were lit. Performances were free to the public, and a coffee can was passed for donations.